Oyster C has got to be one of my favourite restaurants in Hong Kong, for oysters, sashimi and other seafoods in general. Oyster C is categorized as a “Western seafood restaurant”, but it actually has an eclectic menu, with seafood dishes, meat dishes, pastas and Japanese-style sashimi. It used to be situated in Happy Valley, but has later moved to its current location on Hing Fat Street in Tin Hau. The dimly-lit interior of the restaurant is simplistic, with a homely, retro touch to it. The restaurant is only open for dinners, and you should always make a booking in advance as it gets very busy in the weekends despite its inconvenient location! Besides the exquisite seafood, what my friends and I love the most about Oyster C is the free corkage – what can be better than a night with terrific seafood and abundant alcohol? Oyster C has certainly given us many happy, inebriated memories. 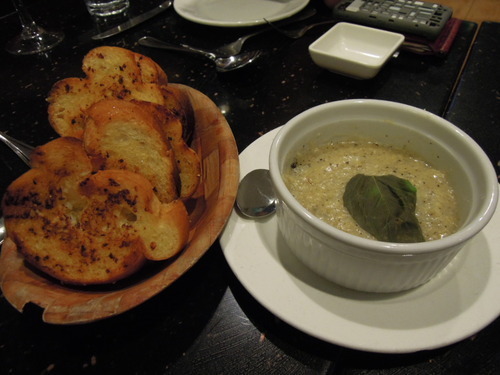 (1) We started off the meal with my favourite appetiser, the Black Truffle and Crabmeat Puree with Garlic Bread ($90). The black truffle and crabmeat puree was creamy and hot and had a strong truffle aroma. The crabmeat was cooked until soft, and the puree came with crunchy, buttery garlic bread. 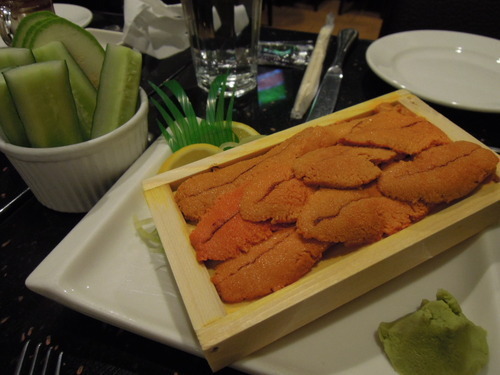 (2) I can never leave Oyster C without having ordered a portion of this Canadian Fresh Sea Urchin Sashimi ($350). This delicate dish of sea urchin never disappoints. The restaurant gave us a choice of seaweed, zucchini or cucumber to go with the sea urchin. I personally thought the slight blandness and crispness of the zucchini matched the sea urchin perfectly, but a lot of my friends enjoy wrapping the sea urchin with sea weed so that the two flavours from the sea would merge beautifully. 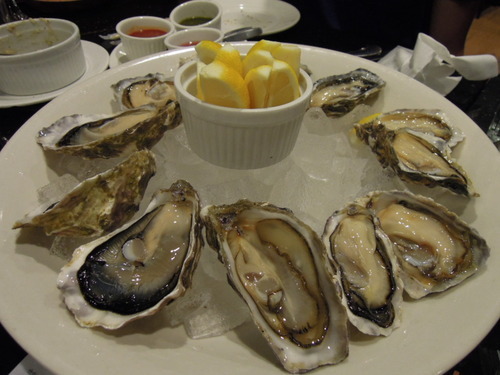 (3) As its name suggests, Oyster C is renowned for their fine selection of fresh oysters. We ordered oysters from Saldanha Bay in South Africa ($36 each), Muirgen oysters from Ireland/ France ($58 each) and oysters from Walvis Bay, Namibia ($58 each). The waiters’ consummate knowledge in oysters means that all you have to do is tell them your preferences, and they will be able to deliver oysters that would suit your tastes. 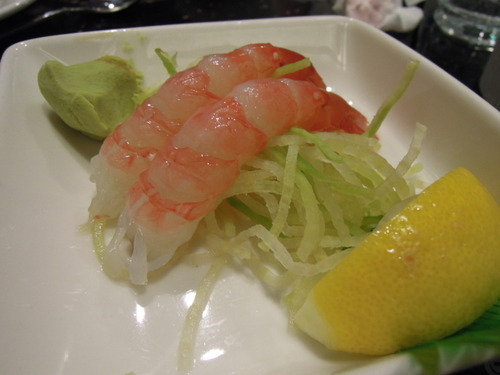 (4) The Canadian Red Spot Prawn Sashimi ($50/piece) was also exceptionally delicious, and tasted incredibly fresh and alluring. 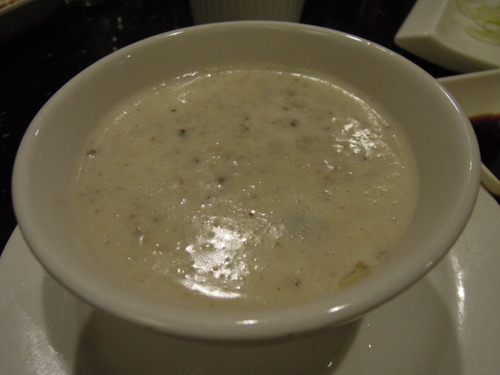 (5) Finished with the seafood, I ordered a small portion Oyster C’s Daily Soup ($30), which was a cream of mushroom soup. The soup was creamy and soothing, and its harmonious flavours were enhanced by a few drops of truffle oil. (6) The pastas at Oyster C are in general very accomplished. 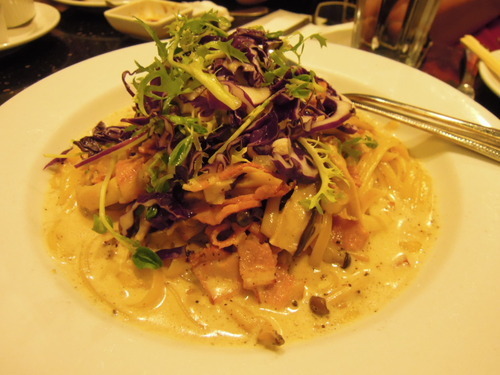 We ordered the Bacon and Mushroom Linguine with White Wine Cream Sauce ($95) – the linguine was al dente, the sauce was thick and satisfying but not too heavy nor filling and the bacon and mushroom were deliciously chunky. It was very comforting to devour some hearty pasta after all the raw seafood madness! 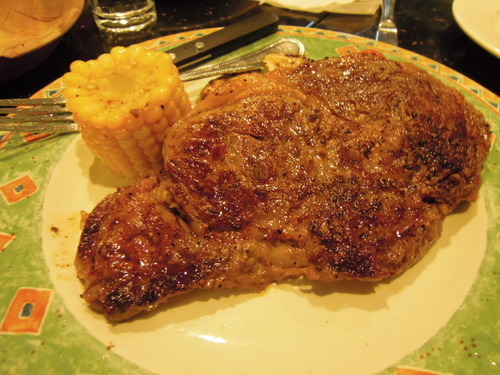 (7) Next, we had the Grilled U.S. Prime Rib Eye Steak, 12oz ($280). The quality of the steak was magnificent – the steak had a strong, attractive taste, and was beautifully fat marbled. The grilled vegetables on the side were simple and delicious. (8) I mentioned that Oyster C serves a selection of Japanese dishes. Besides the Japanese-style sashimi, this Roasted Japanese Mackerel with Salt and Pepper ($180) is another fantastic Japanese option. The skin of the mackerel was grilled to perfection and was gorgeously crispy, and the fish was moist, tender and full of flavours. 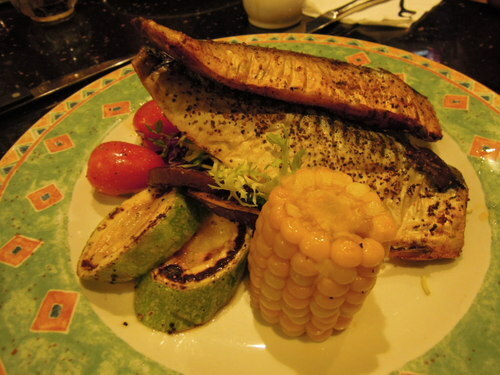 The mackerel was simply seasoned with salt and pepper, making for an unpretentious but impeccable dish. 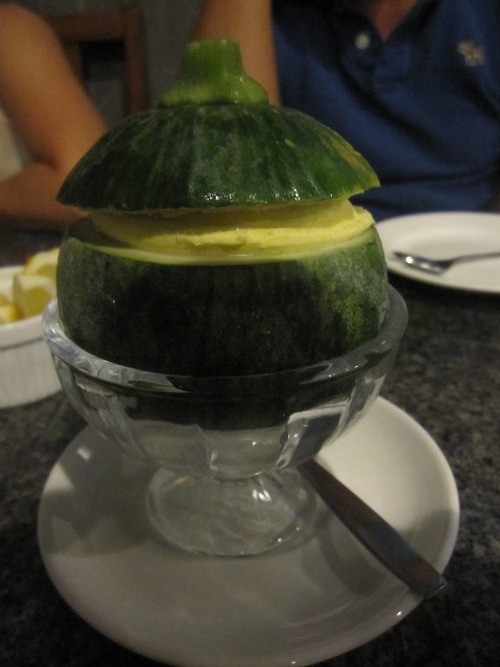 (9) This Japanese Pumpkin Ice Cream ($80) was an instant addiction. Adorably encased in a pumpkin shell, the pumpkin ice cream was smooth and creamy and had a strong, scrumptious pumpkin flavour. Note, though, that the ice cream is usually still hard frozen when it is served, so I will have to eagerly wait for it to thaw before I can attack it with my spoon. Those 10 minutes always feel like hours! Conclusion: Meals at Oyster C typically cost around $600-800 per head, but for all the oysters, sashimi and steak that you have, it is worth every penny. 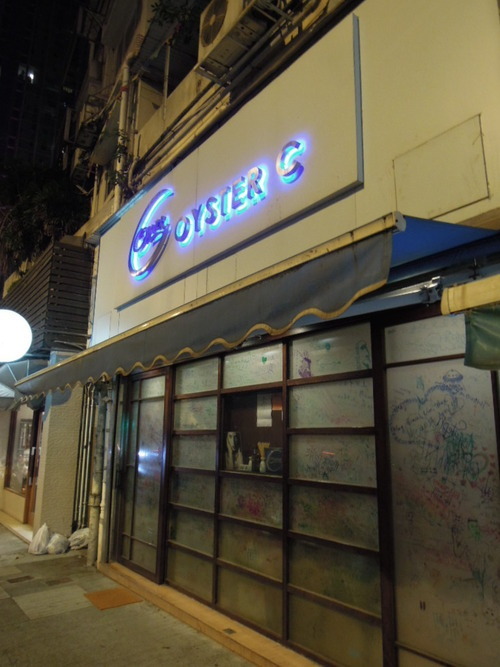 Oyster C will continue to be one of my favourite restaurants in Hong Kong! Many thanks for broadening my seafood dining horizons with your post! I will treat my family to Oyster C this Mother’s Day – really looking forward to it.